If one is to be relaxed as one’s self it helps to be in the right environment. As I am a little boy my bedroom is styled to make sure it is a suitable environment for a little boy. I’ll show you some pictures of some of the things I have in my bedroom. I think it’s a great adult baby bedroom. The thing that was hardest to install was the sun lamp pictured below. 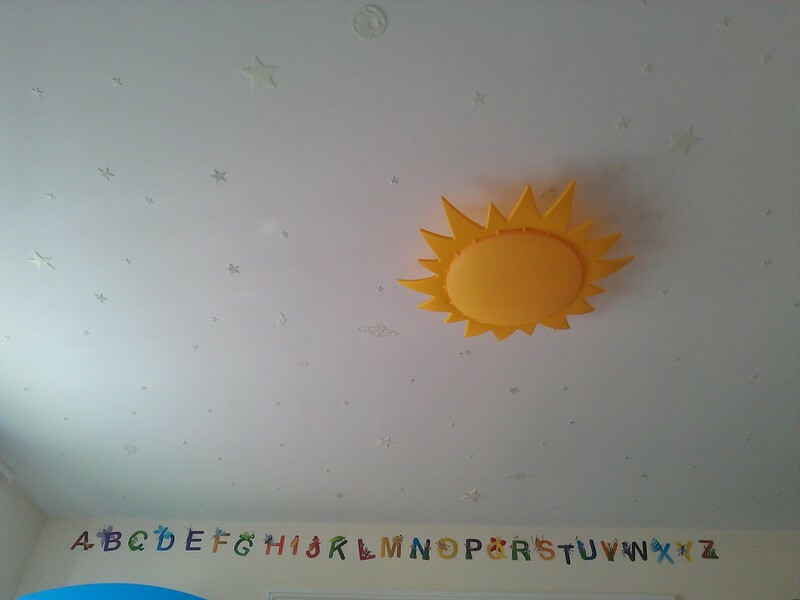 You can also see in that picture that I have glow in the dark stars on the ceiling and some alphabet stickers on the wall. My bed is really cool! I have Beano comic sheets and jungle stickers at the head of it. You can see my three favourite teddy bears, Butter, Toffee and Tunny, sitting on the bed waiting for a cuddle. My other two recent additions are my owl-print curtains and baby blue wardrobe. My wardrobe is stuffed with kid clothes. Finally there is my bedroom door. It has a sign saying “Davy the piglet” on the door because people in where I live, Hampshire, are known as hogs and I’m just a child so I must be a Hampshire piglet! I’ve got number stickers over the door and over Kisu the cat’s bed I’ve got a Miffy print. Miffy is so cute (and also a cracking minimalist design icon)! Isn’t that a cool bedroom for a boy to have? When I go in there I feel happy and at ease with myself; the bedroom is very ‘me’!